Supported by Toyota dealers in Québec, seedlings were distributed this week to more than 450 children in select Québec schools through The Eden Projects, a non-governmental organization with a mission to fight climate change through the conservation and restoration of ecosystems and biodiversity. 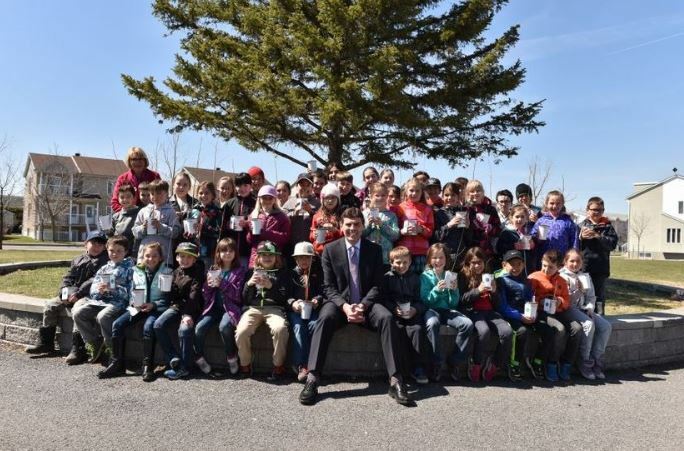 Each student is responsible for taking care of their own tree for a month and these seedlings will be planted to create urban forest in the city of Saint-Jean-sur-Richelieu in May. In addition, for all the trees planted in Quebec, Toyota is having The Eden Projects arrange for students at a school in Madagascar to plant the same number of trees there and provide school supplies. Only 10 per cent of that country’s original forests remain today. In Toronto, Toyota Canada associates took small steps toward a positive impact for the environment and some more literally than others. On April 18, seventeen associates participated in the World Wildlife Foundation (WWF)’s CN Tower Climb for nature, donating over $3,000 to the cause. As is tradition at Toyota Canada during the week of Earth Day celebrations, the company’s executives and associates dedicated their lunch time to cleaning up the outdoor area near the organization’s Head Office in Toronto. This year, they collected a total of 66 bags of garbage and 60 kilograms of other items. In addition, collection days were held throughout the week for household hazardous waste, eWaste and other donations, with the majority distributed to an OES-certified recycler. On the road, Toyota has taken a broad portfolio approach to lead the automotive industry in advanced powertrain innovation for a better, greener tomorrow from conventional gas engines, to hybrids and fuel cell vehicles. By investing time and money into research and development of various mobility solutions, Toyota envisions a low carbon society.